Decisions have never given me much trouble. In fact, I find most decisions liberating. I’ve decided about college, career, husband, babies, houses, investments, plotlines for novels, and one of the biggest of all: a mother of the bride dress. But for the life of me, now that I’m finished with periods, I can’t decide what to do with my leftover tampons. Tampons are turning up everywhere: in purses, drawers, suitcases, book bags, bathroom closets, glove compartments, jewelry boxes, coat pockets, junk drawers, and the oddest place of all, the bottom of a snow boot. I’ve been depositing them in the upstairs closet in a lovely blue bowl. What a collection! I considered a tampon-burning, but that seems a bit harsh. After all, tampons have rescued me on many occasions. I thought of giving them to my daughters, but the girls like another brand. Shelters welcome donations of feminine products, but they prefer new boxes. I could give them to a still-menstruating (yuck-I’ve always hated that word) friend, but it might be awkward handing over a zip lock bag bulging with tampons. So this decision has not been made. No matter what I decide, I’ve got a happy choice ahead of me. Let’s hear it for the liberty to make decisions, and let’s hear it for tampon liberation! And for you younger women still madly tucking tampons here and there, be of cheer, at least tampons are liberating you from what your great-grandmothers went through. 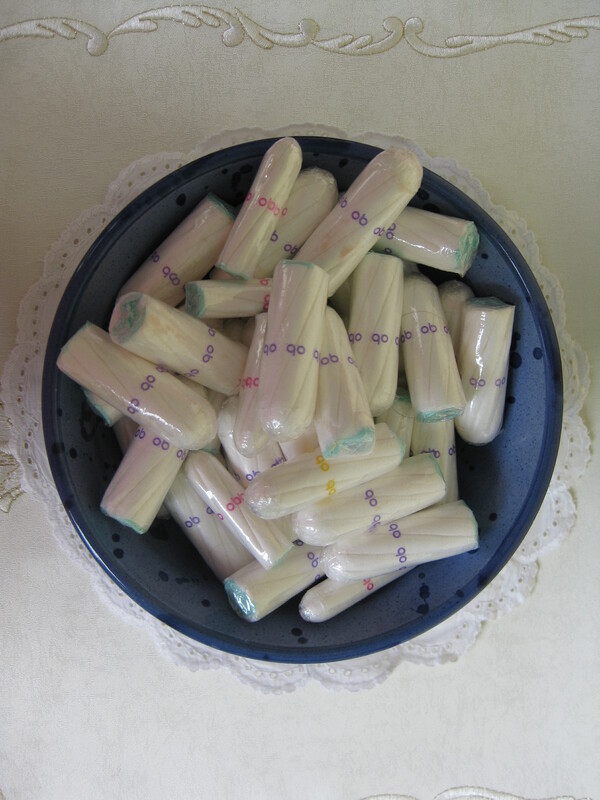 Story Sharing: It’s fun to share our Most Embarrassing Tampon Stories. Please post! Mine was as a 25-year-old school librarian. I spilled my purse and an eighth grade gentleman picked up the contents for me, including several tampons. Photo: I purchased this pretty bowl from a North Carolina potter at our annual Hog Day Festival here in Hillsborough, North Carolina. Seeing all thoe different colors made me immediately think of Christmas tree ornaments! i have always hated tampons!!! but i do affirm that they were a brilliant invention. yeah for tampon lib! I say give them away in a ziplock bag! My friend’s mom did this for me and so did my mom, and I always appreciate the extras. I’ve never had any embarrassing stories.. I’ve have seen my fair share of girls with short dresses on and little strings hanging out. Snip it! Those must have been really short dresses! My mother had to have a hysterectomy when she was in her forties. My family has always been the outdoor type of family: hunting, fishing, camping and such. My mother took her tampons, once she was well, hung them on a tree by the strings (making quite a cute tampon tree!, easter eggs trees were envious) and shot them with her pistol. She said it was the most liberating thing she has ever done. It may take awhile, but I imagine you’ll find a satisfying way of dispensing with them. No embarrassing tampon story, however, I started my period in seventh grade on a very hot day. My bum started feeling smooshy in my seat but I thought I was just sweating. When I stood up the boy behind me said, “Your bleeding all over your chair!” I hightailed it to the school nurse and called my mom to come get me. I avoided that boy for the rest of my school career. Sometimes we’d look at each other and lock eyes and this secret hung between us, I would always blush and look away first. Both of these stories belong in novels! They’re great! I am sure there have been Christmas decorations made with those things but I might suggest donating a box of them to a woman’s shelter (too serious? sorry). I even donate all those toiletries they give you at motels. Believe or not they are grateful for all those things. Thank you for the follow on Twitter. Love your blog. I’m on my way up with some canned goods to our local relief agency. I’ll check. Thanks for good words on blog! Thanks for reading and heading to check yours out now. Oh gosh. What a story! I remember when mine came back after Kath. We were on a fun trip, and then I had terrible cramps. It was a real shock after so many nice period free months. I can’t remember what I did for tampons though! I donated my no longer needed menstrual supplies to the local homeless shelter. They bleed just like the rest of us but no one thinks to donate pads/tampons. Yes, I’ve given boxes to our local relief agency. We collected lots of boxes for a women’s retreat I ran once at church, too. Just wasn’t sure about an open pack. Thanks for commenting! In college we enjoyed using our tampons for crafts, etc. when we were bored. We made tampon earrings, posed for pictures with tampon “cigarettes” and who knows what else. I remember teaching a roommate to use them and she didn’t know to take the carboard out-she obviously thought they were a bit uncomfortable. I once had a tampon sucked right out of me on a Disney ride. One of those that takes you up super high and then drops you. Had no idea that could ever happen! I’ve done a lot of crafts but never with tampons! Very clever. You need to start a tampon craft website. That would be truly unique! True story. I swear….Friend went to the movies with a bit of a headache (full time teacher studying for theology masters and mother of 3 ) the soundtrack was way too loud, so she put a tampon in each ear……end of movie, who should they meet in the lobby but her Headmaster…..yep, still stuck there, and she had short hair !!!!!! Oh my gosh. That is a story of story! Thanks for sharing, esp. such a doozie! I had endometrial ablation 4 months ago; I thought I had used all of the tampons. I now find them everywhere! Fun you found them everywhere too! Good luck with the ablation. A good friend had it and it went well. I don’t have any embarressing tampon stories. I’m fairly hard to embarrass! Just wanted to comment that my mum tried to give me her tampons once she hadn’t gotten a period in a year. I declined since I don’t get a period due to medical reasons. Well wouldn’t ya know it, 2 days later she got her period again! So many keep a couple of them, you never know what your body is going to do next! Fun story: The girls I work with decided to celebrate a co-workers birthday and decorated her car’s back bumper with tampons attached with string. They hide them inside the bumper so she wouldn’t notice. As she pulled away, they all fell down and dangled behind the car. On her way home, people were honking and smiling and she had no idea of why they were doing this until she got home. There she spied the hanging tampons, who during the ride home, soaked up the rain-sleeked roads and stared back at her in full bloom. While quite embarrassed at the time, she loves telling this story and she loves her co-workers as well. Always good to have them on hand for emergencies even if they aren’t the favorite brand. 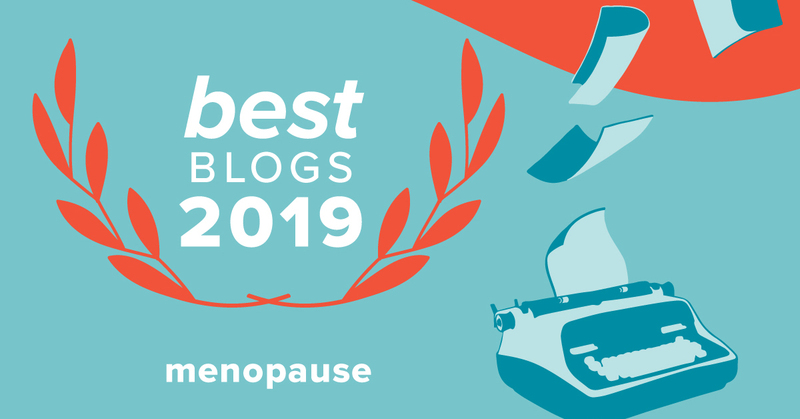 My daughter had a need when we were on vacation last year and was unhappy to realize she was vacationing with a mom who had been through menopause and a pregnant sister-in-law so no luck getting one there. Gosh your poor daughter. Qucki trip to a nearby store I guess. Yes, I’d better keep a few around! Thanks for writing! With 2 days left to go, it looks like 2015 will be the first year since 1975 that I haven’t had to buy tampons! The first time was as a 15 year old with a friend in our local branch of Boots chemists. I had seen the adverts for Lil let tampons in various teen magazines but had still been been using the pads mum had been buying for me since I had started my periods about a couple of years previously. My period wasn’t actually due, but when Sue said she needed to buy tampons I decided that I would try some too – I had been thinking about it for a few months, but hadn’t plucked up the courage to talk to mum about it, or buy some on my own! The last time I bought any was in October last year when I unexpectedly had my first period in about 8 months! It had started at work, but luckily I still had a few tampons in my desk drawer so at least I didn’t have to dash out to buy any! I would LOVE to have you write this up for a guest post! If you’re willing, email me at BKYounger@gmail.com Congrats and happy 2016.